Give your truck a lift with a Zone 3" body lift kit. Zone body lift kits allow you to add larger and more aggressive wheels and tires to your truck or SUV. Each kit is made to fit your specific vehicle. Zone body lift kit blocks are constructed from thermoplastic synthetic resin and have a 60,000lb crush proof capacity. Body bolts, extensions, and all hardware needed to lift your vehicles body is included. 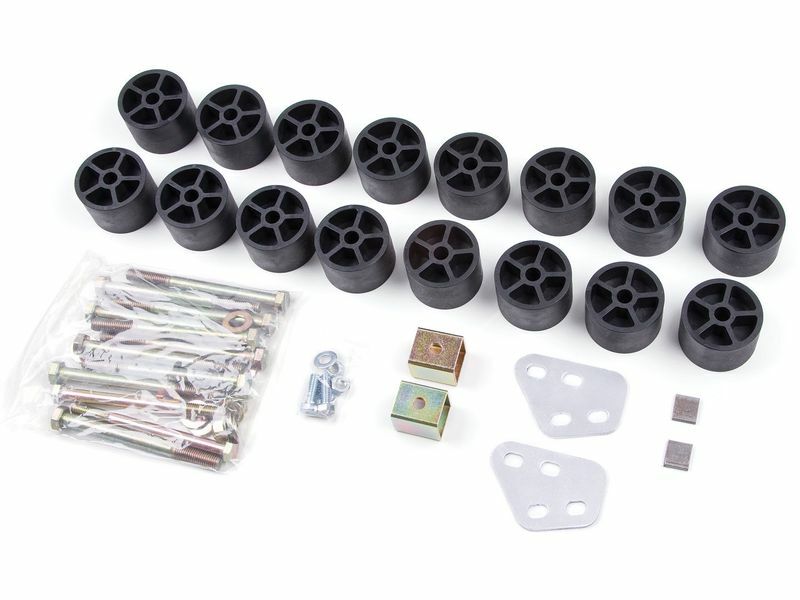 These body lift kits are designed to maintain your factory ride quality and for long term performance. Install a Zone 3" body lift kit on your truck or SUV and hit the trails. Zone body lifts are backed by a limited lifetime warranty and come with clear cut installation instructions. All Zone products come backed by a limited lifetime warranty. This warranty protects against any defects in materials or workmanship. Zone body lift kits offer an easy at home no drill installation. The included instruction manual is easy to read and understand, making your installation headache free.